The predictions sound dire for downtown St. Paul as the water from around the state pours into the Minnesota River and other tributaries before it dumps its stash into the Mississippi and makes its way to the cities. St. Paul has declared an emergency, sounding more concerned than in recent years. Shepard Road will probably close this weekend; it usually gets waterlogged even with a comparatively marginal rise in the river as the city puts sandbags on Sibley and Jackson streets to keep the water below Kellogg Boulevard. But officials sound more concerned this time around. “It’s really the public infrastructure in Lowertown that’s the greatest concern — the parks and some of the government facilities,” St. Paul Emergency Management director Rich Schute tells the Pioneer Press. The city’s downtown airport will face its biggest test since a flood wall was built around it years ago. How bad could it be really? The National Weather Service’s terminology can make things sound more dire than they are. “Flood stage,” for example, is hardly noticeable to the masses. Even with “major flood stage” (17 feet in St. Paul), life goes on relatively unscathed. Downstream, the water threatens the river bank in Newport and the boat ramp at South St. Paul, but otherwise it’s hardly noticeable. Just enough water for a TV reporter to stand in a puddle. The weather service’s description of flooding doesn’t help in the event there’s a real flood and officials need people to take it seriously. And from the sound of things, this is the year to take it seriously. There’s a 50-50 chance the flood stage in St. Paul could reach 22 feet, according to the Pioneer Press. That’s higher than any of the pictures in the collection I’ve been building over the last eight years to show the effects of the river at various flood stages. Twenty-two feet would be 3 feet higher than the last time the river got serious on March 23, 2011, when it hit 19 feet on its way to a 20-foot crest. It looked like this on Shephard Road. And downstream at the intersection of the St. Croix and Mississippi rivers, there wasn’t much to write home about. The usual low-lying areas were underwater, of course, but there wasn’t a big threat beyond that. It was concerning then, but let’s just say it wasn’t close to what the people of Nebraska — and now Iowa — have been going through on the Missouri River this week. 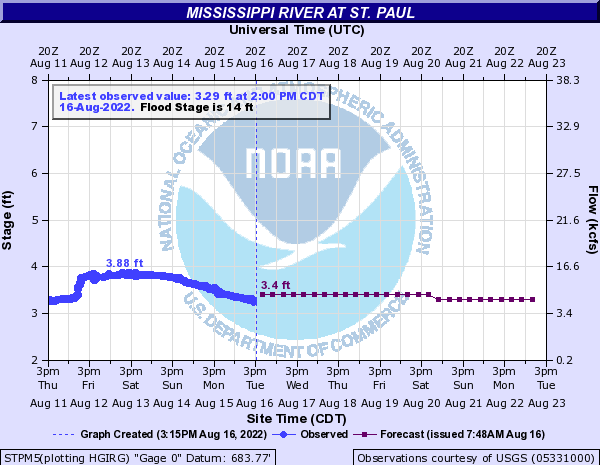 By comparison, the river is only at 8.3 feet, and the furthest out the National Weather Service predicts is a week from today, when it is expected to reach 17.3 feet. When you’re waiting for water to arrive from the rest of the state, floods are a slow-motion affair. If you’d like to contribute to the ongoing collection, go out Thursday and take some pictures of a river near you, note the measurement listed at the National Weather Service’s hydrology site here and send them to me at bcollins@mpr.org.